Get Ready for a Week of All New Shaun T Workouts! This is bananas, YO! I’m excited to announce that Shaun T is back with brand new workouts! 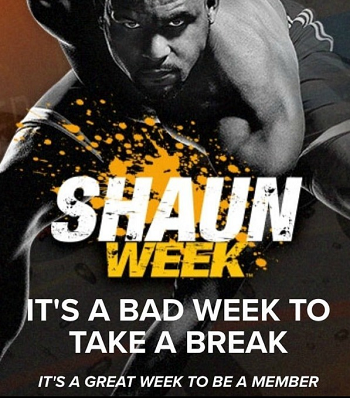 On June 12th, Beachbody on Demand is launching Shaun Week – one week of Shaun T workouts with a new one released each day June 12-18! Shaun Week is one week of fitness that is all about changing your life and transforming your mind and body. It is about getting motivated to get connected to your fitness, to your mental journey and to continuing on with your progress and reaching your health and fitness goals. If you’ve done any of Shaun T’s workouts, such as Insanity, Asylum, or Max 30, then you KNOW any workout from him is intense and gets amazing results! Pure Cardio Part 2: It is going to be amazing! No floor moves in this one. 25 Abs: 25 minutes focused right where we need it. Dig Deep: This is how you end the week with a bang! This one sounds like Friday Fight from Max 30. But don’t think that it stops after 7 days – Shaun T promises a hybrid calendar so that you can complete a full 30-day program! This new set of workouts (Shaun Week) will be EXCLUSIVE to Beachbody on Demand. You can’t miss this! If you don’t have BOD, contact me today to sign up! A quick word on Beachbody on Demand: this is a one-year subscription. During that year, you get access to EVERY. SINGLE. BEACHBODY. Workout. You also get access to any NEW workouts released during the year, AND you get workouts like SHAUN WEEK and programming like as the FIXATE cooking show with Autumn Calabrese that are only available on BOD. You can stream BOD and workout anytime, anywhere with you TV, laptop, tablet, or phone! This doesn’t cost as much as you think. A full year of FULL access to Beachbody on Demand is just $99, and the absolute best value are the challenge pack options. The All Access Performance Challenge Pack is brand new this month! It gives you streaming access to hundreds of workouts, plus a month supply of two performance-boosting supplements with key ingredients to help you push harder, increase your energy, improve your endurance, jump-start your recovery, and combat exercise-induced muscle soreness. All this for just $160! The All Access Shakeology Challenge Pack gives you 24/7 streaming access to Beachbody On Demand, while fueling your body with Shakeology — the superfood shake that helps give you energy, reduce cravings, and accelerates your fitness results. This bundle includes a 30-day supply of Shakeology for just $160! Click here to purchase. Would you like to join me for Shaun Week? I’m putting together an exclusive group for this program, and would love to have you in it! Contact me join.